Ever heard of emergency radios? They are independent electronic devices that is a must-have in your survival kit, which especially comes in handy if you are caught up in a disaster such as tornadoes and hurricanes. So what does it do? First things first, it provides you with weather and disaster alerts happening from NOAA so you are aware of the natural disasters happening at your area. That being said, its primary purpose is to keep you well-informed and connected with the authorities during an emergency situation. You’ll get a heads up and warnings about the disaster that is about to occur so you can prepare yourself beforehand ( food is an important basic need so check out the best emergency food too), before it strikes. As mentioned above that it is highly independent, it functions even if the main power grid is down. In other words, it doesn’t require any electricity or plugging in to work, except for charging of course. The best emergency radios are equipped with varying power options so you get to choose from multiple power options, to power up this electronic device. Some of those options include hand cranking, solar panel or rechargeable batteries. Not only that, it comes with additional features that even allow you to charge your electronic gadgets and acts as a flashlight during low light conditions, for your added convenience. Basically, the size depends on your personal preference. If you plan on travelling outdoors and bringing the radio along such as hiking or camping, it is best if you got a portable one. Its size should be small and compact so you can easily store it into your rucksack or your pocket with maximum convenience. Besides that, some of them actually comes with rubberized finish to improve your grip on it. Conversely, if you plan to use it at home when a disaster strikes, the size doesn’t matter as long as it is convenient enough for you to handle. All in all, despite the size, it is a must have in your survival kit. It is best to go for a radio with multiple power source so you have many alternatives to charge it. Some of the usual power sources include solar panels, hand cranking, rechargeable batteries and USB plug-in. The others include AC and DC charging. The solar panel is the simplest way as you don’t require any form of plugging in or electricity because it is usually left under a bright area, at your window sill for instance, to power up your product. That being said, battery operated radios are important but it is good to have other external options such as AC adaptors, USB charging or hand cranking. This product is rather versatile as it can be used for various type of applications. In other words, it can be utilized as a flashlight, battery charger for your mobile phones or other gadgets, to play music for your entertainment as well as producing weather alerts. The LED flashlight that comes with most radios comes in handy during low light conditions. For charging on the other hand, you can charge your smart phones, MP3 players, cameras and so just by using an USB cord, for added convenience. However, do not expect for your phone to be fully charged as the radio is not designed to completely charge it. Other additional features include the finish of the product. Some comes with water resistant body or rubberized bodies which has its own advantages such as can be used under any weather conditions as well as to improve your grip on it. Also, having an earphone jack is rather an important feature in my opinion, so you are able to connect your headphones and listen to your music privately. It is essential to get a radio with great reception quality so you are able to hear weather alerts, broadcasts as well as music-whatever coming out of the radio, with high clarity and good sound. The antenna plays a big role in ensuring great reception. Hence, it is important to have a good telescopic retractable antenna on your product. Why should it be retractable? So you are able to tuck the antenna away when not in use for easy storage. Not only that, it usually offers AM and FM radio bands as well as NOAA weather alerts so you get updated weather broadcasts at all times, especially during an emergency situation. Getting a radio with top notch quality is highly important, despite the expensive price. However, it all comes down to your budget. If you are able to afford the good ones, it is best you fork out some extra money because it will be well worth your investment in the coming years. Go for the good quality ones that suits your type of use and preference so you will most likely be fully satisfied with your purchase, in the long run. However, to choose the best one, you need to spend a little time doing some research on emergency radios. You can do so by going through customer reviews or product-based reviews. The little time spent on the research won’t hurt you, instead it will benefit you thoroughly in the long run. First things first, it has multiple power options which includes hand crank, rechargeable batteries, solar power and AAA batteries. With the solar power option, it takes a total of 10 hours of direct sunlight to completely charge the battery while for hand cranking power option, it takes 90 seconds of cranking to produce 5 to 7 minutes of radio power. A unique feature of this product is that you are able to charge your smartphone on it, using a USB cord. In other words, you can charge it via the battery dump from the onboard rechargeable battery pack, instead of using the hand crank. However, don’t expect it to fully charge your smart phone without depleting its own battery. Furthermore, it receives both AM and FM radio band frequencies as well as weather-band alerts, for your added convenience in which you are able to listen to music as well as get informed about the current weather conditions. The bands and weather alerts have both excellent reception. It also receives all 7 NOAA weather bands. When the alert button is turned on, the radio will automatically broadcast important and up to date weather alerts such as the occurrence hurricanes and storms to ensure you are well-prepared for the disaster. In terms of safety, it is equipped with a LED flashlight feature as well as an emergency beacon. The emergency beacon consists of a red LED flashing light which is highly important if you are trapped, to attract attention. Also, it has a glow in the dark locator around the rim of the solar panel which comes in handy in low light conditions. In addition to that, it includes an Aux input where you can connect your earphones or headphones according to your preference, if you are not bored listening to the news for instance. With the Aux jack, you can listen to your personal tunes and music as well as play music on an external MP3 player for entertainment. This product has an antenna which is retractable so you are able to move in up or down, depending on your convenience. In other words, you can tuck it away nicely when not in use for easy storage. The antenna allows you to hear the radio stations or weather alerts with better sound clarity. For volume adjustments or so, you can tune it using the knob and up and down buttons with ease. Weighing 1.6 pounds, this product is available in 5 different colors, in which you are able to choose according to your personal preference. The emergency radio is constructed from both impact and water resistant ABS materials therefore, it is rather multipurpose as it is suitable for both indoor home, office use as well as outdoor recreational activities. The telescopic antenna on the other hand, measures up to 14.5 inches in length and comes in handy to ensure high sensitivity reception so you are able to go through radio bands and weather alerts with good sound clarity. That being said, it has 7 pre-programmed NOAA weather channels so you are aware of the real time weather forecast 24/7 in countries such as USA and Canada. The comprehensive coverage of FM and AM weather bands as well as 2-band shortwave allows you to listen to music on the radio, for your entertainment. In addition to that, you can set it on standby mode for any NOAA weather alerts. When it catches a weather alert, it will power up automatically. This feature is important to conserve the radio battery so your product will last for a longer duration of time. Moreover, the built-in speaker delivers loud and crispy sound with good reception and clarity so you can conveniently listen to the news and information delivered without any interruptions. For simple and convenient tuning, this product has an advanced semiconductor circuitry design as well as a LED signal strength indicator to provide you with the best pin-point tuning accuracy. Hence, you can tune into the specific radio bands or stations you desire, with ease. This portable emergency radio can be powered up using 6 multiple ways. They include 3AA batteries, solar panel, hand crank dynamo generator, NiMH rechargeable battery panel, 5V mini USB and lastly, 5V AC/DC input together with a wall power adaptor (sold separately). It is rather convenient as you get to choose from 6 versatile power options, according to your preference. Besides that, it works as an emergency phone battery charger that comes with a built-in standard DC 5V USB port used for charging various types of electronic gadgets such as GPS units, MP3 players, smart phones as well as cameras, for your added convenience. In terms of safety, it includes a 5-LED reading lamp and LED flashlight which can be utilized during low light conditions or for instance, if your home is out of power due to hurricanes and storms. Also, the red LED S.O.S beacon light is important to attract attention to a specific location. You are able to charge the radio using 3 different ways which includes the hand crank option, USB and solar panel. You can utilize the solar panel power up method by just simply leaving it nearby your window during the day to fully charge the battery. That being said, one hour of exposure to optimal sunlight on the solar panel will provide you with around 45 minutes of radio use. Not only that, you are also able to power it up using 6AA batteries, as a battery backup option if the 3 other powering up methods cannot be utilized or accessed. Also, it is equipped with a large and bright backlight LCD display screen of high clarity, paired together with a digital clock feature. The digital display feature on the other hand comes with 3 backlight options which are the off, on and on for 5 seconds which you can choose according to your preference. It has a rechargeable 2600 mAh lithium ion battery that can be replaced according to your preference. Moreover, the battery can be connected to a USB output, which can be utilized to charge portable electronic devices such as mobile phones, GPS and MP3 players. It lasts for about 32 hours of normal use before you have to recharge it again. This radio is rather versatile as it not only can be used to get news update and play music (the usual) but also acts as a flashlight. In other words, it is equipped with a bright CREE LED flashlight with 130 Lumens. Also, it comes with a S.O.S flashlight beacon that displays the morse code if you are somehow trapped at a specific location, during a hurricane or tornado for instance. Its ultrasonic dog whistle comes in handy to alert and assist the search and rescue teams, guiding them to your location if you are lost in a forest, for instance during camping or hiking. It plays both AM and FM radio bands as well as NOAA emergency weather alert to notify you about the current weather updates, during an emergency situation. An audible siren will activate when the alerts are received. The flashlight and the LED backlight will flash on and off for a minute while the alert is stored for an hour. That being said, the NOAA emergency broadcast alert is loud and clear so you are least likely to miss any important updates. Also, this product is rather simple to use and has a good reception. First things first, this product is a public alert certified weather radio. It successfully alerts you of severe weather warnings such as hurricanes, storms and tornadoes therefore giving you a heads up or weather updates, even if the main power grid is down. It comes with a backlit LCD display that displays bright and clear information. The built-in adjustable LED on the other hand includes a few modes such as low, hi, blinking and S.O.S morse code. The morse code is essential especially if you are in danger, to alert the public, authorities as well as search and rescue team about your location. Not only that, this product is equipped with a loud emergency buzzer feature which comes in handy, in terms of safety. Apart from that, the high power lithium ion battery with rating 850 mAh is rechargeable using 3 different methods. These charging methods include hand cranking, USB connection and solar power. Furthermore, it has a rather versatile function as you can charge your electronic devices using the USB compatible cords, which supplies from USB A to Micro B cable. In other words, the DC Out (5V/0.3A) USB A port is used for charging your MP3 players and mobile phones meanwhile the DC In (5V/0.5A) Micro B port is able to power up your radio conveniently. This radio has a weather alert setting in which alerts you when any disasters are about to strike. So, if a national weather alert is issued, you will not likely miss the alert because there will be some sort of alarm, then followed by the actual alert, to ensure your undivided attention towards the vitality of the situation. Apart from that, this product comes with a hand strap so it is rather portable to carry outdoors in your hand without worrying about it falling to the ground. The stereo headphone output on the other hand allows you to connect an earphone so you can privately listen to music, for your added convenience. The radio does not have any tone controls, however the sound is good and clear enough without them. It is advised you get new rechargeable batteries since the one provided are deemed not too good in terms of quality. In addition to that, it is able to access the DSP digital AM, FM and WX Tuner radio bands which can be tuned digitally rather than having to manually dial in the channels. Also, it has 19 pre-sets of mixed AM and FM radio bands. Not only that, it includes the 90 minute auto shut-off feature that conserves your energy as well as a built-in clock for your convenience. La Crosse’s radio has a rather compact size, thereby making it portable and simple to transport, especially if you plan to use them outdoors for camping, boating or hiking activities. Due to its small size, you can even put them in your pockets, for your added convenience of accessing it at all times. Moreover, it comes with all 7 channels of the NOAA weather bands. The 7 different weather band channels provides updates on the current weather information so you are aware of a storm heading your way, for instance. It has a telescopic antenna, measuring around 9 inches in length which is extremely important for excellent FM and weather alert reception. You can also set the NOAA channel to be on standby mode, when not in use. When on standby, the radio will be silent until the alert comes in. When it does on the other hand, the radio will automatically crank up its volume, producing an alert sound followed by the alert message, to get your undivided attention. This product is basically a digital radio which has a USA-made IC chip of high quality. The digital radio makes it a lot simpler to operate, as you can tune them simply by putting in the radio channels you desire digitally, rather than manually adjusting them, which just takes a long time. Its ergonomic and rugged design consists of a rubberized finish to increase your grip so it is least likely to fall to the ground. In other words, it comes with a protective outer shell which further contributes to the product’s portability and durability since it is rather strong and sturdy. The blue LED backlight is essential so that your LCD display screen is clear and easy to read. The blue color will turn red once a weather alert is issued so you are aware of it. Also, it has a 3.5mm earphone jack socket in which you are able to plug in your headphones to privately listen to music. The DC power jack on the other hand allows you to connect it to a DC output in order to charge your battery, when you have power supply. However, you need to get a wall adaptor separately to do so. The sound clarity overall is rather clear and loud, despite the small size of this survival radio. Also, it comes with a carry strap and hands-free clip so you can carry it conveniently, according to your preference. The digital tuner of this radio allows you to tune in to your desired radio station with ease, rather than tediously having to manually tune it until you get your favourite channel. Not only that, it is equipped with a LED backlight and digital liquid crystal so everything displayed on the screen is crystal clear. This product includes 3 radio bands overall which includes the AM and FM broadcast frequency as well as the NOAA VHF weather frequency so you get to play music from your favourite radio station and get updates on the latest information about the weather alert, which comes in handy during an emergency situation. Furthermore, there are 5 varying ways you are able to charge your emergency radio. These ways include the hand cranking, solar panel method, USB plug-in, AC and DC connection, in which you can conveniently choose according to your preference. Two minutes of cranking will provide you with 20 minutes of power for your product. In terms of design, this radio is rather compact in size, thus very portable especially if you plan on transporting it outdoors. That being said, it is designed to slip easily into your large jacket pocket or to be attached to your belt with the sturdy carabiner clip so it stays secure in position, limiting any chances of it dropping to the ground. The rugged body and solar panels on the other hand are highly durable as they are water resistant and built to last, in the long run hence, very well worth your investment. Its retractable antenna allows you to tuck it away when not in use so you can store it properly. Also, the antenna ensures great reception and good sound quality and volume, for your added convenience. Apart from that, it includes an earphone jack together with a USB port which can be utilized to charge your mobile phone. However, don’t expect it to charge completely as it will only drain your radio battery. It is rather versatile as it can be used to hear emergency broadcast, acts as a 3-LED flashlight during low light conditions and a mobile phone charger, with maximum ease. The flashlight is bright enough with minimal cranking, for your convenience. For it to charge through its solar panel, you just need to leave it in a bright location and voila, the solar cell keeps the battery topped up. Also, it includes a good sturdy handle that further contributes to easy portability. 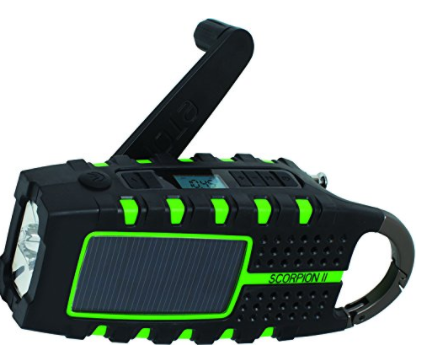 The Eton Scorpion digital radio has 3 varying power options which includes the rechargeable lithium battery, solar panel as well as hand cranking. The solar panels are efficient enough to keep the radio playing while it’s being charged under the sun, even if not fully charged, for your added convenience. Apart from that, it receives NOAA weather bands as well as AM and FM radio bands to keep you well-informed about the current weather situation, during an emergency situation or so you can play music for entertainment. That being said, the NOAA weather bands brings you weather forecasts, emergency messages as well as alerts, which are extremely essential to travelers and backpackers outdoors. The power and radio band selection you desire can be made by making adjustments to the button located on top of the unit but below the handle. Meanwhile, the radio tuning and volume adjustments are made by turning the dials. All in all, it is rather simple to operate. Furthermore, there is a battery charge indicator on the LCD screen so you are aware of the battery level and power you have left on your radio, hence you are able to plan your usage accordingly to conserve the power. Also, it comes with rechargeable 800 mAh lithium battery which is utilized as one of the methods to charge your survival radio. Equipped with a rugged finish, this product has a strong exterior skin together with an aluminium carabiner, designed to endure any outdoor weather conditions. It is also IPX4 splash proof, hence it can be utilized during rainy weather conditions specifically, without getting damaged. The radio is rather a compact unit so you can keep it conveniently in your survival kit or toss it in your rucksack for maximum convenience, therefore contributing to its portability. Its 5V 1A USB output cable allows you to charge your electronic devices such as MP3 players and smart phones with maximum ease. In addition to that, the digital display and tuner ensures accurate and smooth tuning as well as reception. Since its digital, you need not manually tune the radio until you come across your favourite radio station. Also, it is equipped with bright long lasting ½ Watt LED flashlight, which comes in handy especially during low light conditions. All in all, an emergency radio is rather an essential tool to have in your survival tool kit. During a disaster, it would probably be your only source of knowing what is happening out there as well as serves to give you a heads up about the weather alerts so you can prepare yourself before it strikes. This type of radio has multiple type of power options, in which you can choose depending on your convenience. Not only that, it is rather versatile as it can be used for broadcasting weather alerts, provide you with music, acts as a flashlight as well as able to charge your electronic gadgets. That being said, I hope my review assists you in making the decision in choosing the right survival radio (check out survival water filters too! ).